Aim: The purpose of this study was to evaluate the visual functions of workers exposed to organic solvents in petrochemical industries. Materials and Methods: Thirty workers from the petroleum refinery and 30 age-matched controls (mean age) were recruited. 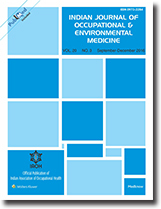 Visual functions and occupational exposure levels were assessed among both the groups. Visual acuity, contrast sensitivity, color vision, and visual fields were evaluated at the workplace. The biological samples, namely blood and urine, were collected at the workplace and transported to the laboratory for analysis. The urinary excretion of hippuric and methylhippuric acid as well as creatinine was measured by high performance liquid chromatography. Results: The mean age of the workers and controls were 39.7 ± 7.6 years and 38.6 ± 8.1, years respectively. The mean years of experience of the workers were 15.6 ± 6.8 years. Visual acuity was >0.01 LogMAR among both the control and case groups. 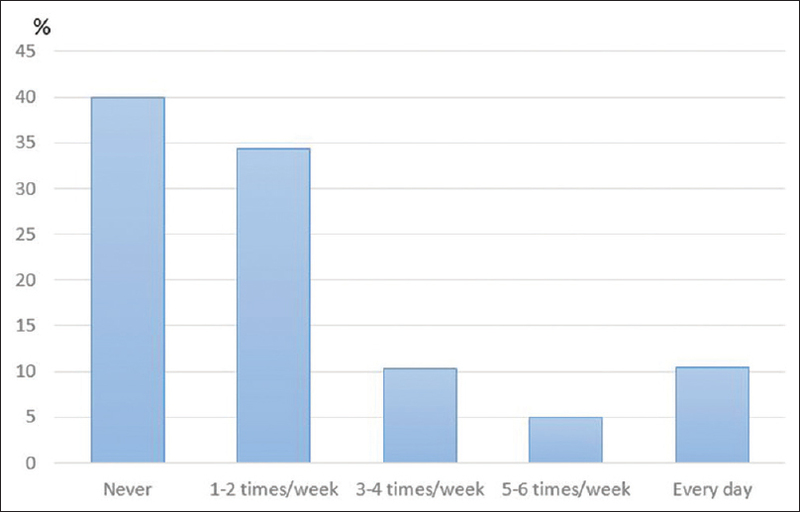 The contrast sensitivity was reduced at 12cpd among workers. 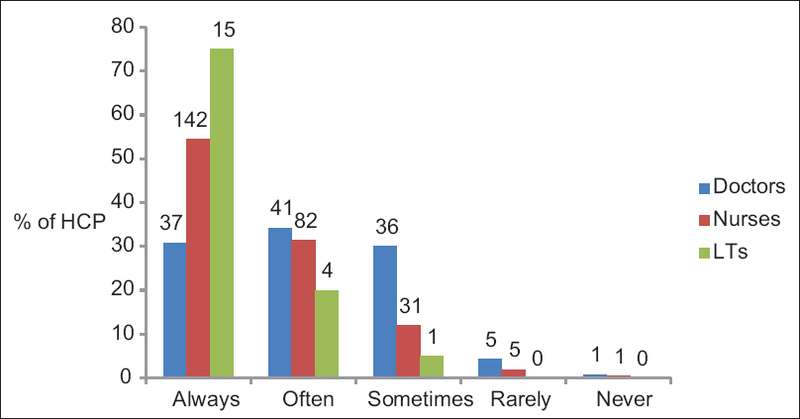 Comparison between groups was done using independent sample t-test. The mean difference in color confusion index was 0.11 ± 0.05 (P = 0.037*). The mean difference in visual fields was −0.31 ± 0.36 dB (P = 0.933). The mean difference in urinary hippuric acid level (urinary metabolite of toluene) between the groups was 0.19 ± 0.96 g/g creatinine (P = 0.049*). The mean difference in the excretion of methylhippuric acid (urinary metabolite of xylene) was 0.06 ± 0.04g/g creatinine (P = 0.154). 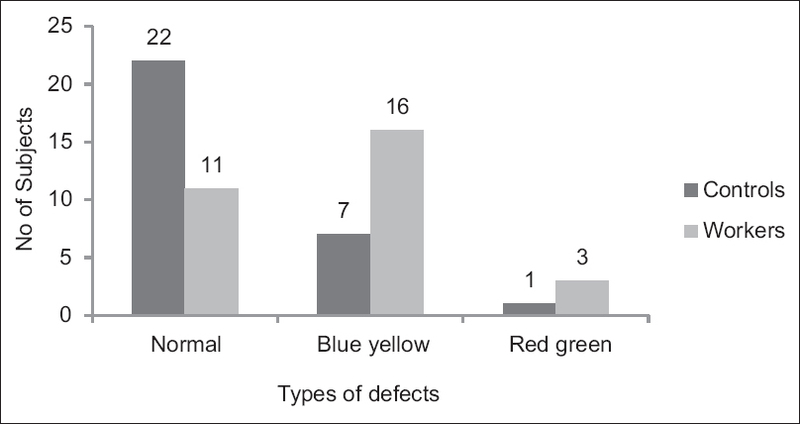 We also found that exposure was a significant risk factor for color vision defect with an odds ratio of 4.43 (95% CI: 1.36–14.4); P = 0.013. Conclusion: The study results showed that contrast sensitivity and color vision were affected among workers in petrochemical industry.